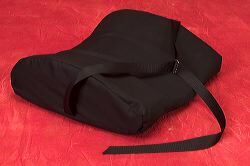 Made of polyester fiber lining with a blue, light weight, disposable cover. 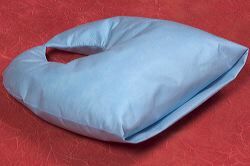 Designed to support neck and head while traveling, resting or sleeping. 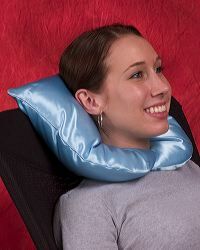 Works well as restful support for cervical collar patients. 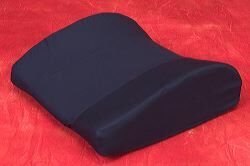 An excellent support to lumbo-sacral and sacroiliac areas, the Lumbar Cushion is designed to enhance the healing effects to the lumbar spine. It provides a gentle tractioning effect to help ligaments, muscles and other tissues readapt to their correct alignment. 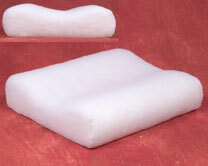 Accepted as one of the best aids in the treatment of neck disorders, this pillow is made with soft polyester fibers. 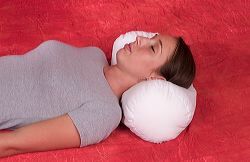 Helps maintain proper alignment of the neck while sleeping. Length: 17 inches, Diameter: 7 inches. 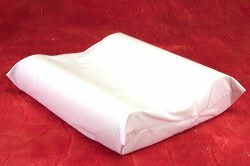 Made of polyurethane foam with a white cotton cover and overlapping fabric closure. 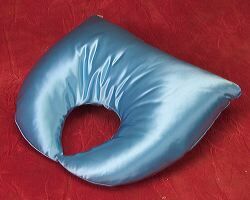 Designed to support neck and head while sleeping; helps prevent cramped or stiff necks. 17 inches wide x 20 inches long.